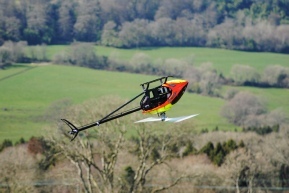 Charmouth is the longest running funfly in the UK. 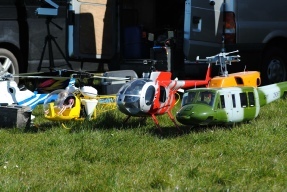 Run twice a year by the AHA, it is a great opportunity for helicopter pilots from all disciplines and club/sport flyers to get together. See below for more information. Anybody wishing to set up a trade stand of any description MUST contact the organisers (AHA Committee) prior to the weekend. NOTE: this is primarily a fun-fly event & although a few small trade stands will be allowed, it is not our intention to turn Charmouth into a trade event. Accommodation (primarily caravans), en-suite rooms & lodges can be booked at Newlands Holiday Park. When making your booking (01297 560259) be sure to mention you are booking for the heli weekend that way you get preferential rates. Evening socialising normally takes place in the bar area of Newlands both Friday & Saturday evenings. TX CONTROL: £5 per pilot per day. Plus £5 deposit for ID card (refunded on return of the card at the end of the day)NOTE: Everyone with both 35MHz & 2.4GHz must register at tx control. Flying starts at 9.00am, although Tx control is normally open from around 8.30am for check-in. 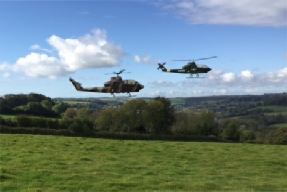 Tx control closes at around 5pm both Saturday & Sunday, although there will be off-the-peg flying afterwards. You must produce proof of BMFA membership or you will not be allowed to fly. 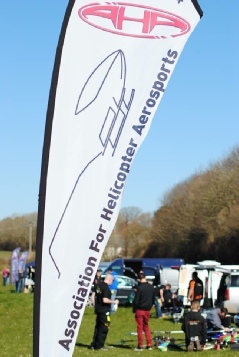 All pilots require a minimum of an 'A(H)' certificate in order to fly solo at this event, however if you do not have your ‘A(H)' certificate, then you MUST be accompanied by a ‘B(H)’ certificated pilot whenever you fly. However, the organisers reserve the right to exclude ANY pilot who is considered by them to be flying in a dangerous or un-safe manner. The rules are simple and if followed will allow everyone to fly safely. No more than 10 pilots are allowed to fly at any given time. Each pilot has approx. 15 mins flying time. Following comments from some pilots that they felt uncomfortable with some of the 3D flying taking place right next to them (sometimes on either side of them), it has been decided to reserve the far end of the field for use by those less experienced or who just want to fly their scale / sport models more sedately. Thank you to the team at ACCURC their donation and supporting the AHA.